Surrey, Canada: Despite announcement of worldwide withdrawal of controversial Nanak Shah Fakir film on April 21, the movie is still being screened in a cinema hall of Surrey. 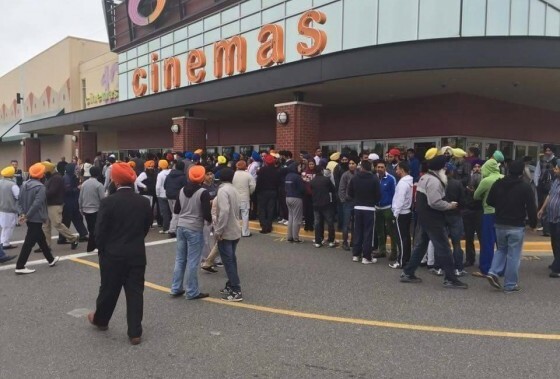 A news reported by Global News notes that [t]here was a protest outside a movie theatre in Surrey on the night of April 26. “Hundreds of people gathered to try to stop Strawberry Hills Cinemas from showing the controversial film Nanak Shah Fakir”, notes the Global News. There were several police on scene as a precaution, but no protesters were asked to move, the Global News notes further. It is notable that the screenings of Nanak Shah Fakir film in Canada were dropped by the distributor even before it’s release, but the producer was able to make some arrangements to get the movie screened in Toronto before announcement of withdrawal on April 21. It may be recalled here that the controversial film portraying Guru Nanak Ji, His family members and Bhai Mardana ji in clear violation of established Sikh tenets, was released by Harinder Sikka on April 17. The movie was released ignoring widespread opposition of the movie by Akal Takht Jathedar, SGPC, DSGMC and the global Sikh community. But after the movie failed at box-office, rather it triggered massive protests from Sikh community Harinder Sikka, in April 21, announced to withdraw the film. He had said that the decision to withdraw the film was taken in order to uphold the supremacy of Akal Takht Sahib. The fact of Nanak Shah Fakir being screened in Surrey once again exposes the dual character of film producer Harinder Sikka.